BetterJPEG allows for editing JPEG images without recompression. Lossless operations include rotation, flip, crop, red eye removal, date/text/EXIF data imprinting and more. 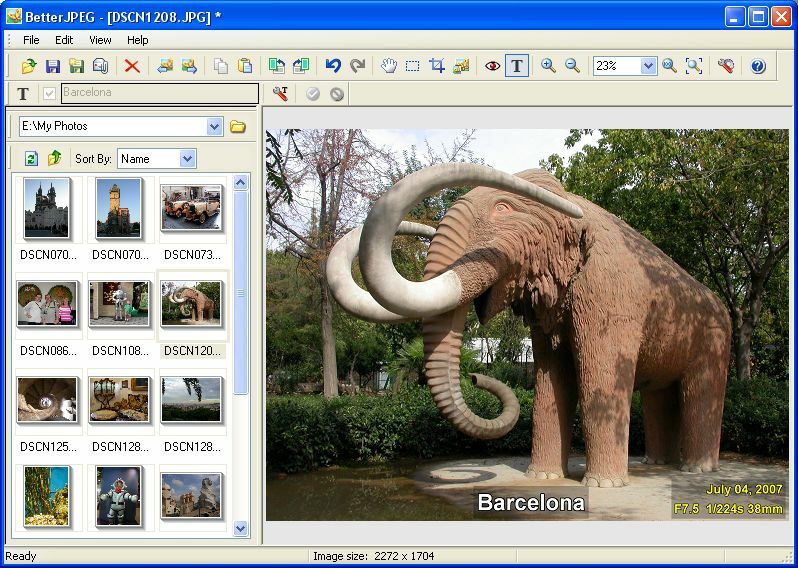 Intuitive GUI allows for fast processing of multiple images. phrentec is correct when it comes to cropping, rotation, flipping, and EXIF-related functions. There are many free apps which can perform these tasks losslessly. However, BetterJPEG also supports editing, and it ensures that only the edited region is recompressed upon save. I haven't seen such capability in any other app outside of specialized medical imaging systems. On the other hand, there really isn't a huge audience for this capability outside of such niches. Long ago, marketing people at Canon, Kodak, etc. figured out that the vast majority of typical users (home/personal) like to know that they "could" edit their photos if they wanted to, but they rarely actually do so. That's why there are so many photo printers which print directly from digital cameras and/or memory cards. Out of the rare times that such users do edit, they seldom edit a photo multiple times, and if they are concerned about quality, merely setting the JPEG option in their editing software to 100% quality will minimize single-generation degradation enough to be tolerable for non-professional use. Often, these users will want to apply global changes to exposure (brightness, contrast, gamma, etc.) or noise reduction. Those kinds of edits render BetterJPEG useless. The professional audience never uses JPEG as a source format, and thus never needs to edit it. For the few people who would find this product useful, be aware that the built-in editing capability is limited to red eye reduction. For other retouching, BetterJPEG works with your external editor of choice. Basically, it compares pre-edit and post-edit bitmaps to identify the region(s) changed. It then writes your finished JPEG by copying unchanged regions as-is, recompressing only the changes. If you happen to use Photoshop, you can get better integration for this process via BetterJPEG's Photoshop plug-in, a separate product (see their site). This is a nice app that does well what the author has set out to do. And yes, jpegcrop.exe is free but total crap. Sometimes $23 dollars is worth a much improved workspace and toolset. New beta is getting better all the time. One thing I'd like to see is a toggle button on the crop toolbar to allow/disallow crops outside the image. It's a pain having to go back and forth in the preferences. Nice program for what it's meant to do. On a side note however I wish the horrible jpeg format would just die already. I use it to cut JPEGs into pieces when designing site layouts. This way I can cut a single image into several pieces without losing quality. Nice for creating non-rectangular image areas on web sites out of JPEGs. "Hmm, wouldn't recompression still have to be done for the area where reduction was performed?" Not necessarily, if you can make the changes directly on the dct coeffs. Don't confuse people. Color change affects DCT for all 3 channels. Recompression for 8x8 block is required. BetterJPEG is good at what it does. I use it as the initial program I use having taken the pictures off my camera. I crop to 4x6 and use read eye reduction before saving copies to the same folder as the originals. I only fire up PSP9 if they need to be messed around with prior to sending to Shutterfly for printing, due to the JPEG degradation. A features I like to see would be the 'Save As' name having _crop added rather than _copy if a crop has been performed, and _re if only red-eye had been performed, and even automatically making the save a 'Save As' if the image had been modified - I never want to modify the content of the original. This program does things that IrfanView doesn't. I use both. Lossless/no recompression even for red-eye reduction? Hmm, wouldn't recompression still have to be done for the area where reduction was performed? Excellent program, small, fast, efficient. Good to see frequent updates. blackcherry: your comment on price per kilobyte is nonsensical, according to your logic a big bloated program is better value. What do your comments have to do with this app's performance? You like having Gbs of TIFFs on your system? Cool. But others like editing the images as they come from their camera with no degradation. If an image app doesn't have lossless JPG handling, why bother with it? Why not use Irfanview 3.91 which is free and has Losless operations. I'll back up the BetterJPEG. I like the idea of lossless editing of the JPEG images. I tried to stamp dates to images in EXIFer and BreezeBrowser but resaving them caused noticeable degradation (even with the highest quality settings). Resaving images in lossless format might be a good idea for in-depth editing of the images but when all you need is to insert a date to a dozen of photos BetterJPEG has a sensible advantage over this approach - it does not increase size while retaining quality. Why lose something when you can avoid it? Suggestion to save image into a lossless format when all I want is to rotate, crop or stamp is rediculous. Tiffs take tens time more space, more time to transmit, more time to load in slide-shows, etc. Why resave it to Tiff when I can have SAME quality in JPEG? BTW, I am very happy with the red eye removal algorithm. P.S.Irfanview, ACDSee, etc. have no lossless operations apart from rotation / flip. No lossless crop, no lossless date stamp, no lossless red-eye, no lossless copy/paste, etc.